PORTLAND, Ore., Sporting Alert – Damian Lillard poured in a career-high 51 points to lead the Portland Trail Blazers to a shocking 137-105 victory over the Golden State Warriors on Friday night. Lillard, who bettered his previous career-best of 43 points, made nine 3-pointers and shot 18-of-28 from the floor overall on Friday night while adding seven assists and six steals for the Trail Blazers (28-27). “They kicked our butts. They served everything, but we should have put up a better effort, a better fight in the third quarter,” added after the defeat. C.J. McCollum added 21 points, seven assists, four rebounds and two steals, Mason Plumlee grabbed 12 points, five rebounds and five assists, Gerald Henderson scored 12 points and Maurice Harkless ended with 11 points and eight boards for Portland in the victory. The Warriors (48-5) were led by leading scorer Stephen Curry, who made seven 3-pointers and finished with 31 points and five assists. Klay Thompson added 23 points and Draymond Green, who turned the ball over nine times, supported with 14 points, 12 rebounds and eight assists for Golden State which had its 11 game winning streak snapped. Marreese Speights chipped in with 10 points and six rebounds for the defending NBA champions, who were allowing the most points in any game — regular season or postseason — in the last two years. Portland caught fire late in the first quarter to score 42 points in that stanza and pull away from the Warriors, with Lillard scoring 17 in that period and Curry getting 16 for the travelers. The Trail Blazers, who shot 56.7 percent from 3-point range (17-30) and 53.6 percent overall from the floor (52-97), led by as many as 38 points late in the fourth quarter en route to handing Golden State its worst loss of the season. As a team, the Warriors were held to just 39.1 percent from the floor after going 36-of-92, while shooting 35.3 percent (12-34) from long-range. It was the worst loss by a defending champion since the Miami Heat lost by 42 points to the Chicago Bulls in 2006-07. “I couldn’t be more happy with our effort defensively,” Lillard said. Golden State trailed by 6-points at halftime, but the NBA leaders turned the ball over 13 times in the third quarter, which helped Portland to build a 27-point advantage — something Kerr wasn’t particularly pleased about. The Warriors will be hoping to quickly shake off the defeat on Friday night when they face-off with Western Conference rivals the Los Angeles Clippers at STAPLES Center on Saturday night. 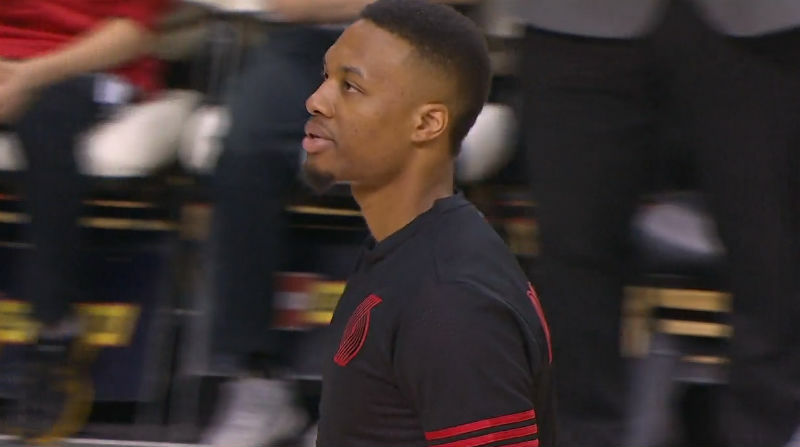 Lillard and the Portland Trail Blazers will host the Utah Jazz on Sunday.